Oh wow! 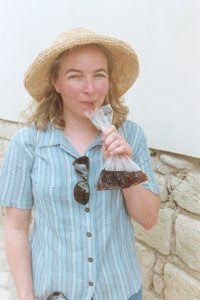 On my first honeymoon in Cancun, we marveled at how great the Coke tasted that was offered on the tour bus. In a smaller glass bottle and simply wonderful! Different from home, that's for sure. It HAD to be the real cane sugar! In college I lived in a cooperative house for a summer. In the basement/kitchen/dining room there was an old style soda machine. As I recall, it only cost a nickle for a 6 oz (or could it have been 8 oz?) soda in a glass bottle. Bottle opener built into the side and everything. This was in the early 1990s--wonder if it is still there? Cold drinks always taste colder and more refreshing when served in a heavy glass container. It must have something to do with the conductivity and heat transfer. I will never forget the taste of the old A&W root beer served in a frosted mug. I grew up in Burien and as I recall the nearest A&W was out past SEA-TAC. We have driven for miles to get one. 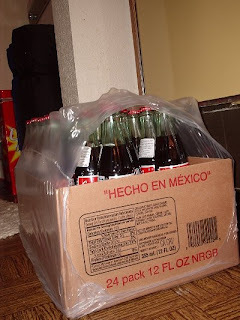 I'm not a huge soda fan (i quit drinking most sodas like 5 years ago) but when I first moved to Los Angeles a friend of mine took me to a small taqueria and asked if I like coca-cola. I started to respond "No" when he interupted me and said "well it doesn't matter because you've never had Mexican coca-cola." He ordered up two frosties for us as well as some carnitas tacos and it is just the best damned soda period. And the bottles are so thick too! It's pure amazement, I say, pure amazement! I have a friend who brings back Canadian coke for the same reason. ...real sugar. There are smaller companies in the US that also make old fashioned soda in glass containers with cane sugar. My Girl Scout troop toured a tiny place in New Britain, CT (Avery Beverages) and they got to make their own soda by mixing syrup flavors. They sell weird flavors that appeal to kids, like "Swamp Juice." You have to add fermented and processed sugar cane extract with a dash of lime!